“When I first volunteered in Honduras, I noticed that snack chip bags were all over the ground in the village of Siete de Abril. With no reliable waste system, the families have to burn the chip bags in front of their homes. Hazardous trash burning seemed like the only way to clean up, until I went to the D.C. Green Festival. 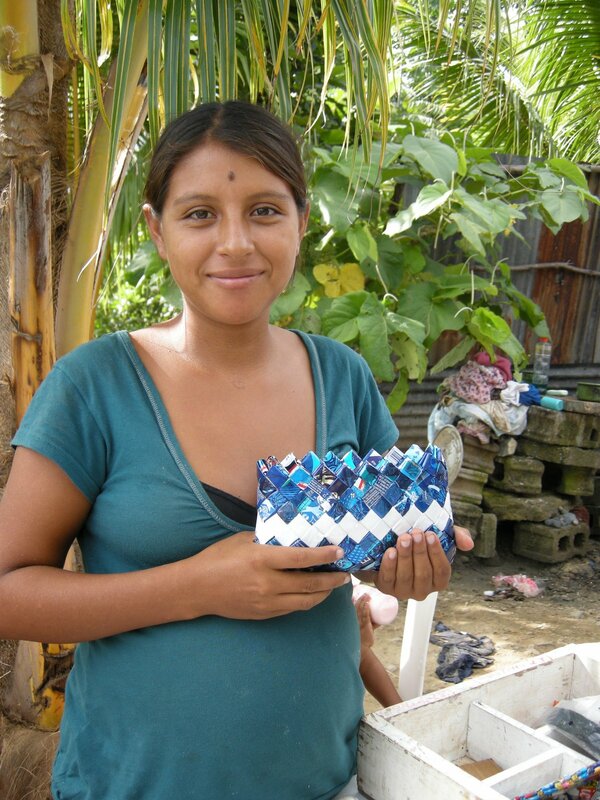 I found chip bags that were being made throughout Latin America by small, groups of women in poor communities. The project was perfect for Siete de Abril. It would reduce the hazardous burning of trash, and provide women with an income. This summer I worked with five other students as an intern for Students Helping Honduras. Over the summer, I held daily bag classes for four or five women. The beginning was chaotic. There were kids running around with rulers and scissors, competing to collect discarded chip bags. Many of the women had to bring their infants to class; breast-feeding breaks were constant. Younger siblings would help with childcare, so their older sisters could focus. Neighbors, parents, and school kids were always visiting class. The atmosphere of bag class was lively and loving. I feel like the community was excited by the potential of the project. It was the third week of class, when Carmen said, “We should name ourselves.” That’s when the group became more than a class. They named themselves, Esfuerza de Amor, Strength of Love. When I returned to the US, I heard that the women sold almost every bag to the volunteer trips. Carmen could buy food and medicine for her young kids. Reina got off to a fresh start, when she repaid a small debt. Keyla could afford more clothes, medicine, and food for her sick father and newborn baby. One day the bag profits will go beyond basic needs, and towards things like education.